Schoolhouse Pumpkin is delightfully spooky for the autumn season. This lovely project measures just 12 x 12 inches making it perfect for a tabletop display, an add-in to your "Mini-Wall", or frame it for the spooky season. We used classic Fig Tree colors in apricot and butterscotch with a tried and true black. 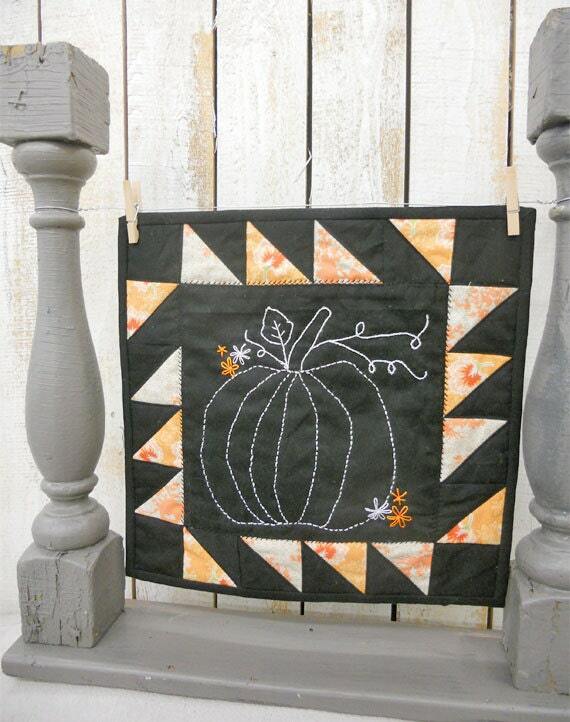 Then added a white embroidered pumpkin with some autumn colored flowers. Classic and modern all rolled up together! Embroidery stitches used are stem, French Knots, straight, and lazy daisy. Refer to your favorite embroidery book for stitch directions. Kit includes: fabrics for the front, binding and threads. Pattern is a beginner/advanced level.